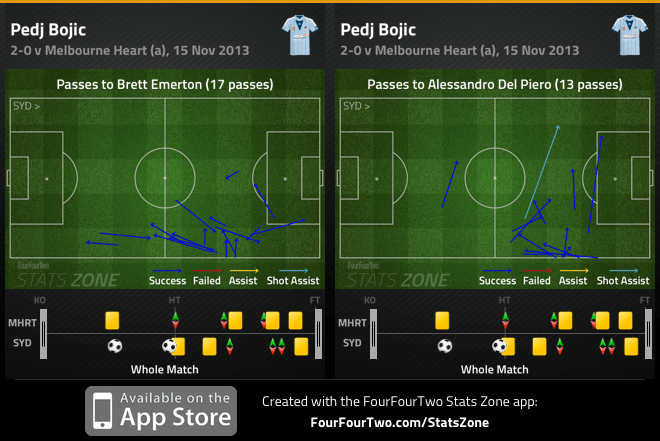 A prominent feature of Sydney FC’s 2-0 win over Melbourne Heart was the attacking influence of Pedj Bojic. The right-back, signed in the winter from Central Coast Mariners and widely lauded as one of, if not the best attacking full-back in the league, frequently got forward to send in a stream of steady crosses and cutbacks, as well as hitting some clever passes to teammates in the middle. Sydney’s attacking play was heavily biased towards the right, and Bojic was responsible for his side’s two most frequent combinations. The key was Sydney’s fluent positional rotation down that particular flank, with Brett Emerton pushing across from his right-sided central midfield berth to cover the space vacated by Bojic’s forward runs. Often, Emerton was in a deep, wide covering position, practically leaving his midfield partner, Nick Carle, on his own to protect the defence. On paper, it’s an ideal combination. Emerton always featured as a right-sided player for Blackburn Rovers in the Premier League, and has extensive experience in that sort of disciplined, demanding role – he’s never quite been a ‘star’ player, and this sort of deployment, as a ‘facilitator’, seems to suit him more. In fact, Emerton appeared buoyed by the responsibility, at one point furiously encouraging Bojic to get in advance of him, and on a few occasions, even overlapping Bojic himself to provide a third attacking threat – it was quite a bizarre situation, having a central midfielder overlapping a right-back that had overlapped a right-winger. The multiple sources of width also meant Sydney’s right forward, Joel Chianese, wasn’t concerned with maintaining width, and consistently drove inside into goalscoring positions – obvious for the game’s second goal, but also evident in the first minute, when he came close to tapping in a low cross from the left and later when he set up Carle for a shot that hit the side-netting. The best illustration of this theme, though, was on the sixty minute mark – Bojic streams forward, Chianese shifts inside, and the former sets up the latter in front of goal for a fine chance that is just spurned wide. Of course, the natural by-product of this was that Heart naturally had space to counter into, but as a general statement, their transitions were very poor and they rarely transferred the ball to Williams quickly on the break (even though, in theory, the Heart would be the ideal team to exploit a side’s vulnerability in wide areas on the counter). Besides, Bojic and Emerton are both fit, energetic players, and were comfortable chasing back into a defensive position when the ball was turned over. Sydney have previously experimented with this sort of positional rotation in pre-season. In the 4-3-3 used extensively then (which has curiously been discarded in favour of 4-2-3-1), the two advanced players in the midfield triangle – Carle was deeper – often shifted into what seemed like very odd positions close to the touchline, but the trouble was that Sydney’s passing in deep positions at that stage was very poor, and the central defenders were frequently being caught stranded on the ball. Here, the process was more fluent – once the ball had been worked into the middle third, then Emerton shuffled across to cover Bojic, and crucially, Carle kept a disciplined position in front of the back four, to ensure the central defenders weren’t left exposed. It remains to be seen whether this is a long-term ploy (and pre-season preparation suggests it is) and whether it will work against the A-League’s stronger sides. The main feature of Heart’s season so far has been Aloisi’s pragmatic approach, asking his side to defend in two compact banks of four, but they’ve not been particularly playing with any particular defensive solidity. Sydney found it easy to play around their initial pressure, and a side that closes down at a higher intensity (like Brisbane Roar) might flag the obvious weaknesses in this intriguing tactical ploy from Frank Farina, as well as exposing the obvious vulnerabilities of having only Nick Carle to protect the defence at transitions.